Nicky Hiscock, WWT’s conservation breeding assistant has been caring for the spoon-billed sandpipers since they arrived in the UK. We’ve posted some more footage from the CCTV cameras that monitor the birds below and you can see Nicky going in with the birds. She’s described for us the daily routine in the quarantine station. You’ll see in the footage, I’m wearing overalls and rubber shoes. Obviously it’s vital to minimise the risk of any bugs getting to the birds, so changing clothes and handwashing is the first thing you do as you arrive at quarantine. I get in first thing in the morning. I check the birds via the CCTV (so I’m seeing them as you are on the video here). It’s such a useful tool; it really helps us to monitor them without causing any disturbance. 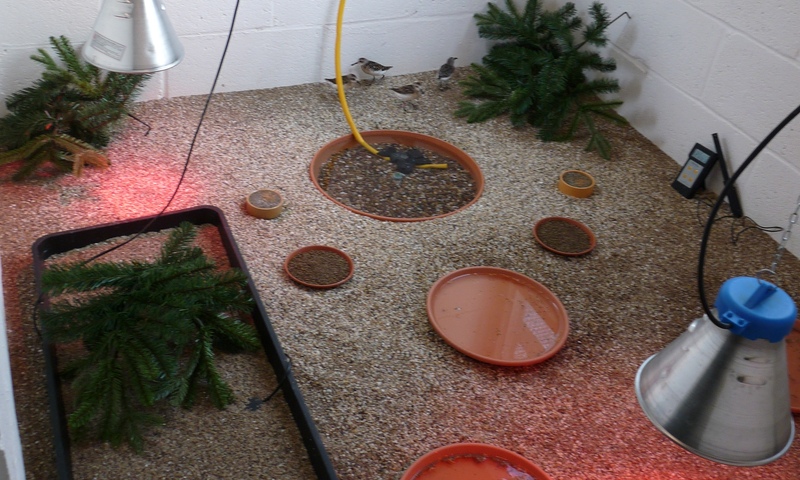 Because of the size of the rooms in the quarantine station, the birds are in three small groups. When I change their food and check on them, I do each group in sequence, completing all checks on one before moving on to the next. So, once I’ve got all their food ready, I go in to the first group. You can’t hear it on the video, but I give a little whistle before going in, so they’re not spooked when I open the door. Once in there, I kneel down so not to intimidate the birds too much. And I always move really slowly and quietly, keeping an eye on where they all are. I visually check that the birds are all alright. I take temperature and humidity readings – particularly checking the max and min readings overnight. You’ll see me making notes. I’m also writing down how much food they’ve taken. We want to avoid handling the birds as much as possible, so this is a good alternative to weighing them. I take all the old food bowls out, empty and wash them. I try to replace the clean bowls in the same position so not to upset their routine. As Nige explained last week, the three large terracotta-coloured dishes are filled with water. Two are fresh water, while the other is a salt bath. They are all very shallow and you’ll see me sprinkle some dried shrimps and protein-rich food pellets on top. The spoon-billed sandpipers are filter-feeders – they sift through shallow coastal waters with those unusual bills – so giving them some of their food this way mimics that natural feeding. It’s something Nige and Roland tried while the birds were in Moscow Zoo and they responded really well to it. But they don’t take all their food this way. I fill the smaller bowls with the special food pellets (which are rich in protein and contain all the components needed in their diet). Two of the bowls are left dry and I add water to the other two to soak the pellets. This way they get their food in a variety of forms and they seem to take advantage of that, eating from all the bowls. After that I might stay for a minute or two to assess their feet and check that they’re all behaving normally. It’s vital to scan the flock thoroughly. They are so small that they could go downhill very rapidly if they got a disease. Once everything’s done, I leave straight away and return to the CCTV monitors to check that they’re settling quickly. They usually have and are feeding happily. Fascinating – such a privilege to be kept up to date with this wonderful project – Thank you! Yes – great to be kept up to date. Always exciting to see a SBS email in my inbox. Great to see Nige H plugging away at his marathon SBS fundraiser. Full of admiration. If you’re reading this and you haven’t done so already, why not give him and the sandpipers a Christmas present and sponsor him?